Dan O’Connor delivers pies. CT Post photo Brian Pounds. 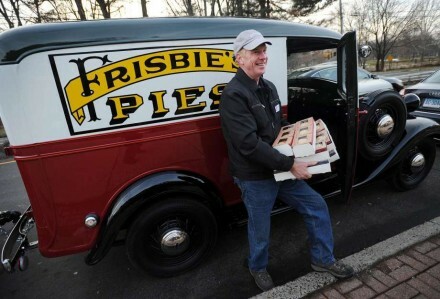 It all started in 1871, when William Frisbie baked five-cent pies from a house on Kossuth Street on the East Side and delivered them by horse and wagon. Company employees flinged the heavy metal pie tins during breaks, many finding the bottom of the Pequonnock River. Yale students got in on the fun too and well, eventually, The Wham-O toy company marketed the tins recreationally as Frisbees. The pies are now back for local dessert distribution thanks to Dan O’Connor. 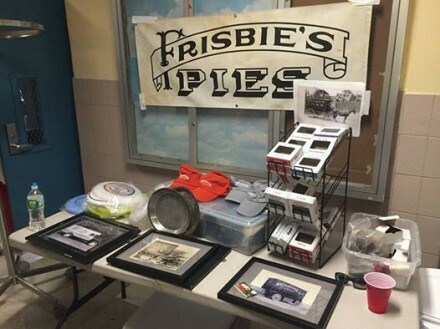 Dan O’Connor’s interest in the former Frisbie Pie Co.–the business credited with the invention of the flying disc later named the Frisbee–began when he found an old pie tin in a tag sale just after college. An avid Frisbee player at the time, O’Connor, a Fairfield resident, said he hadn’t realized the extensive local history connected to the classic toy. The story goes that children and college students from Bridgeport to New Haven’s Yale University would throw the metal pie tins created by William Russell Frisbie’s business as a game, and yell “Frisbie!” to warn of an incoming disc. Next Post:OIB Poll: Is Ganim Correct To Attend Trump’s Inauguration? GOOD LUCK to Frisbie Pies. Love this. Love this guy to pieces and don’t even know him!